7 by 10 $70.00 Acrylic on gessoed masonite. No koi in these folks… sorry. This is from the tribute to “Monet” pond series. I’ve painted a blue one, a lavender and now a green one. I added a little brown to off set all that green. I think the contrast is nice. Contrast is my favorite element of art. I like opposites I guess. It was a beautiful day here in South Carolina, the lake was full of boaters. I would venture to guess not nearly as many as in previous years, perhaps the high cost of gas is hurting some folks and they decided to just have a cook out and bar be que some dogs or burgers out in the back yard. I was invited to canoe down the Catawba River but decided to work in my yard. Usually I just have to put in a few days and its good all year. So far Its coming along. I’ll take some more photos of it so you can see how things are growing. I fell asleep for a few minutes out on the back deck this afternoon. The sound of water bubbling and the birds, it was really calm. I repotted the plants I bought yesterday and fed all my plants. My dogs thought it was too hot so I sent them in the house. They love the good ole AC. Who doesn’t! I’m going to work on my larger project tonight its coming along too. I’ll post it’s progress in about an hour. I worked on it till 11 pm last night and would have worked on it longer but everyone wanted to go to bed. 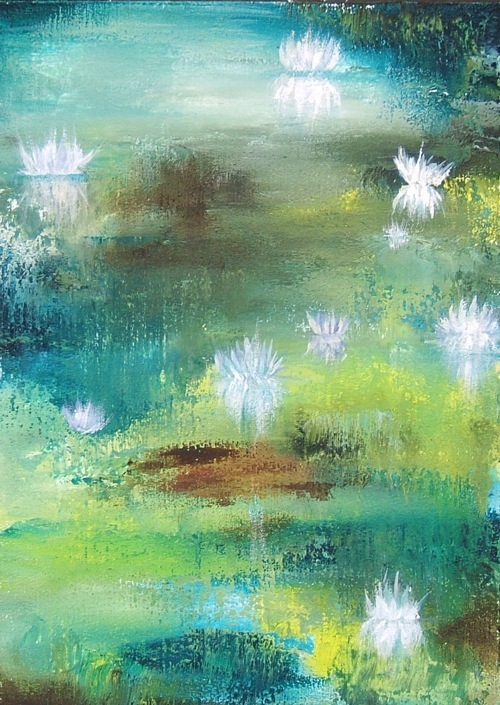 This entry was posted in Uncategorized and tagged A painting a day, acrylic, blue, brown, green, monet, pond, shanti marie, water lilies, water paintings by shanti marie. Bookmark the permalink.